Bundelkhand has developed a fatigue from the endless sermons on protecting the environment. Discussions on environmental degradation seem to have reached the nadir for this region, which comprises 13 contagious districts of Uttar Pradesh and Madhya Pradesh that have suffered 13 droughts in the last 15 years. Local communities, who have endured an unprecedented human crisis, perceive a disconnect between their own problems and the solutions being thrown at them. I was travelling through the region recently, not as a reporter looking for crisis stories, but as part of a team that was assessing villages that were not affected by drought. There are many such villages in Bundelkhand. The villagers did not have to apply rocket science. Just common economic and ecological sense. They harvested water through traditional tanks, enforced community regulation over water usage and abandoned water-guzzling crops. When I spoke to the local residents and community leaders on the formula for such a feat, the answer was unequivocal: don’t teach us environmental protection; for us it is all about our economy. They pointed out that too much focus on approaching drought from an environmental perspective had weaned away people from drought management. “Why do you need to preach water conservation to people who are forced to migrate due to water scarcity?” Rather, one village leader said, one should approach the problem from a purely economic point of view. The villages that have fought drought successfully have approached the problem from this perspective. So, a check dam idea was not sold as a water conservation tool, but as an instrument of economic insurance. Many told me that the moment water conservation ideas are resold as lucrative investment options, they are instantly bought by the people. For example, many farmers have dug farm ponds on their own land, not bothering about the loss of farm size that otherwise would have been used to grow crops. More villagers were convinced about the economic logic, rather than the ecological argument of conserving water. Assured water in a small pond could irrigate about 1-2 hectares of farm, thus increasing the income from the same farm. I met a goshala owner taking care of 200 abandoned cows. At the drop of a hat, he spewed venom against those sending cows to abattoirs. He admitted to raids on vehicles taking away cows for slaughter. But when I asked him how he was managing such a large number of cows when fodder was expensive, his answer was simple: don’t get sentimental about cows; treat them as an economic asset. Notwithstanding his strong religious reservations over cow slaughter, he had devised a business model: he offers cow dung to farmers in exchange for any food suitable for his stock. “Farmers are excited about this. I sold them this idea not as a Hindu propagating cow conservation, but as an economic exchange,” he said. Cows can’t be saved just because they are sacred. They too need to live, and for that, they need fodder. We need to redefine our approach to environmental crises like the current drought. 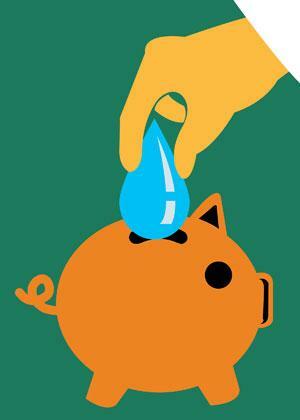 The simple message of saving water, it seems, has lost traction with local communities. Rather, linking their economic desperation to water conservation and the subsequent promise of economic turnaround helps strike a chord. This could be the reason the government’s target-driven model of creating thousands of water harvesting structures has not been wholeheartedly accepted by local communities. It is time the critical link between the economy and the ecology finds resonance in drought-proofing policies.